If you love Florida Georgia Line, then prepare for some exciting end-of-year news!! Country’s best-loved duo are coming to Las Vegas this December for a 5-date series of shows at Zappos Theater at Planet Hollywood!! Catch them on Wednesday 5th December 2018 – tickets available NOW!! Since their breakout single “Cruise” in 2012, Tyler Hubbard and Brian Kelley, the two members of Florida Georgia Line, have been delighting the country world with their particular brand of “bro-country” – songs about girls, drinking, driving, and generally living the good life. To date, they have released three best-selling full-length studio albums, “Here's to the Good Times,” of 2012 “Anything Goes,” in 2014, and most recently, 2016’s “Dig Your Roots”. 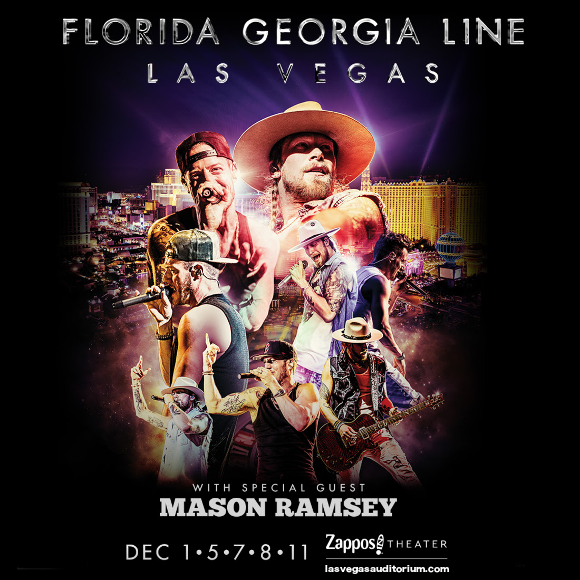 Now, Florida Georgia line have announced an all-new residency show in Planet Hollywood, with support from the incredible Mason Ramsey!! What are you waiting for?? Grab those tickets while they last! !